Various universe evolution scenarios. 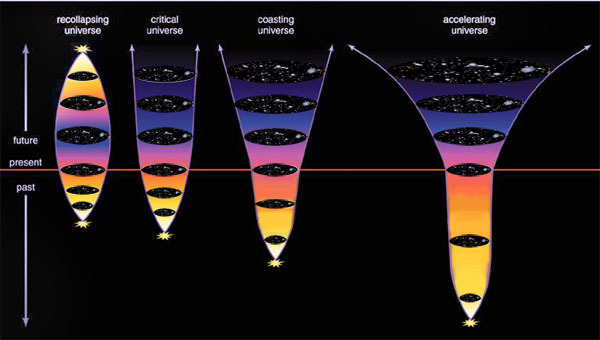 From left: A universe with too much density collapses in on itself, a critical density universe stays static, a universe with not enough density keeps expanding at a steady (coasting) rate. Then there's what actually seems to be happening: the rate of expansion is speeding up. The evolution of the universe is governed by the amount of dark matter and dark energy it contains, but the densities of dark matter and dark energy—their concentrations within a given volume of space—are affected very differently by cosmic expansion. We have a good idea of how much dark matter the universe holds, and although we don't know precisely what it is, we do know it is affected by gravity. The key, then, to understanding the eventual fate of the Universe lies in understanding the other half of this dark equation: dark energy. Currently cosmologists understand almost nothing about dark energy even though it appears to comprise about 70 percent of the mass-energy content of the universe. They are desperately seeking to uncover its fundamental properties: its strength, its permanence, and any variation with direction. They must learn the properties of dark matter before they can determine its influence on the expanding Universe. This evolution in cosmic scale is schematically shown in the above figure for several cosmologies. In a universe with a high density of dark matter, the Hubble expansion that began with the Big Bang continues to decelerate due to the gravitation attraction of the dark matter filling the universe, ending in a big crunch. In a universe with a lower critical density of dark matter, the expansion coasts. In a universe with dark energy as well as dark matter, the initial deceleration is reversed at late times by the increasing dominance of dark energy. If the hypothetical dark energy continues to dominate the universe's energy balance, then the current expansion of space will continue to accelerate, exponentially. Structures which are not already gravitationally bound will ultimately fly apart. The Earth and the Milky Way would remain undisturbed while the rest of the universe appears to run away from us. The nature of dark energy is currently a matter of speculation. Some believe that dark energy might be "vacuum energy," represented by the "cosmological constant" (Λ, the Greek capital letter lambda) in general relativity, a constant uniform density of dark energy throughout all of space that is independent of time or the universe's expansion. This notion was introduced by Einstein, and is consistent with our limited observations to date. Alternatively, dark energy might vary with cosmic time. Only new kinds of observations can settle the issue.